Powdered Acai with organic certification. Important support for the Immune System and Antioxidant function. 100% Acai (Euterpe oleracea) powder. Suitable for vegans and vegetarians. Made from plants. Acai extract (Euterpe olearacea). It provides 50mg of Acai per daily dose. Blend of berries, roots, and fruits from ecological agriculture. With vitamins and minerals. Moringa and Açai supplement with Vitamin C, minerals and B group vitamins that favour a healthy immune system. Cleaning and detoxification of the digestive system. The most powerful antioxidant on the market. Acai is the fruit of the Euterpe Oleracea species, used for centuries in primitive areas of Brazil. It has numerous properties, for example its highly antioxidant capabilities, boosting of the immune system, effectiveness against cardiovascular diseases and additionally in treating constipation, thanks to its high fibre content. The acai is considered to be an extraordinary fruit and every day more and more people are including it in dietary plans aimed at improving health. This berry has great effects on energy levels as well as increasing the vitality and resilience of those who consume it, making it ideal for athletes. What are the properties of the acai berry? Who should take an Acai Berry supplement? The acai berry has a high protein content and is rich in omega 3, 6 and 9. It is considered to be one of the best natural foods thanks to its antioxidant effects, can prevent various diseases and help us to maintain a healthy immune system. Acai Berry is the fruit of the açaí berry or manaca palm (Euterpe oleracea). It is native to Central and South America, specifically areas around the Amazon River. They are rounded berries of a dark purple colour, that look quite similar to blueberries and grapes. They have a mildly acidic, bitter taste (many people say that it resembles the taste of pure chocolate,) they are fleshy and quite juicy. Its characteristic deep purple colour is due to the large amount of pigment it contains, known as anthocyanins, substances which possess a powerful antioxidant effect and which are possibly responsible for the majority of its benefits for the body. Acai berries have been used for centuries by indigenous tribes, although it is only recently that their amazing health giving properties have begun to be discovered by the rest of the world. In fact, consuming Acai berries has become fashionable and they have come to be regarded as a "superfood". In countries such as Brazil, Colombia, Peru, Suriname, Guyana and Venezuela, their consumption and trade is a tradition as this fruit has long been part of the local cuisine. In the aforementioned countries, especially Brazil, it is very common to find this berry as an ingredient in a multitude of drinks, desserts, soft drinks and even spirits. In the rest of the world, including Spain, it has become popular and can usually be found in pharmacys, herbalists and even fruit shops. For many, acai is considered a miracle fruit, as its properties offer many benefits to the human body, as well as preventing disease through the fortification of the immune system. That's also why acai is included in many multi-purpose diets, since the benefits obtained through its use can contribute to overall healthy. A curious fact about acai berries is that they are only collected by hand. In fact, acai harvesting is an economic activity par excellence in the state of Pará, Brazil. The berries are harvested in the mornings and in the evenings the fruit is taken to the markets in the city of Belém. Part of the harvest is used to make acai powder and is taken to a mill where the pulp is extracted. It is important to note that when the acai fruit is ripe it tends to deteriorate very quickly, therefore to maintain its high nutritional content the fruit should be processed within 24 hours after it is taken from the tree. This is the reason why outside of Brazil the best way of taking acai is through dehydrated powder, in a capsule or frozen. The acai berry consists of 8% protein, 52% carbohydrates and 32% fat. Vitamin A: the berries are a source of vitamin A, important for the formation and maintenance of teeth, bone tissue, soft tissue and mucous membranes. Vitamin B complex (B1, B2, B3, B6 and B12 vitamins): involved in the metabolic processes and that contribute to the synthesis of glucose and amino acids. They are important for the proper functioning of the immune system. Vitamin C: it has antioxidant and modulating capacities for the immune system. It promotes the assimilation of iron, the healthy generation and repair of tissues and is involved in the metabolism of fats. Antioxidants (anthocyanins): the best way of fighting against the attack of free radicals is through the consumption of antioxidants. Acai berry is a source of antioxidants and balances the interactions between atoms and molecules in the body, helping to delay the ageing of cells and improving overall health. Essential fatty acids: thanks to its fatty acids (Omega 3, Omega 6 and Omega 9) this berry is of great asistance when it comes to adjusting HDL cholesterol levels, thereby eliminating bad cholesterol. Fibre: they are a great source of fibre, a beneficial substance in treating constipation and maintaining digestive health. Calcium: the function of this important mineral is the formation and maintenance of bones and teeth, as well as the optimisation of other metabolic functions. Amino acids: the fact that it posses 16 different amino acids make this Amazonian berry a perfect food for athletes, vegetarians or simply those who are looking for a good quality vegetable protein. The main qualities of the acai berry include its antioxidant action (it contains anthocyanins, vitamin C and vitamin E) that protects the body’s cells from the attack of free radicals. Specifically, the acai has the ability to neutralise free radicals such as peroxide and superoxide. One important fact is the ORAC (Oxygen Radical Absorbance Capacity) value of this superfood, a special measure that indicates the capacity for free radical absorption in foods. 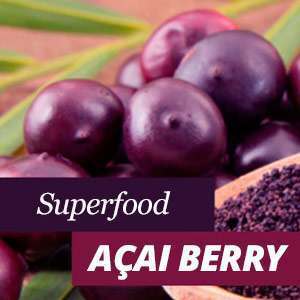 The acai berry has a very high ORAC value, exceeding blueberries, plums and raspberries to a large extent. According to research published in the "Journal of Agriculture and Food Chemistry" and the "International Journal of Food Sciences and Nutrition", we require 3500 ORAC units daily to be able to effectively fight against the action of free radicals. The problem is that the general population only consumes an average 1200 units a day. Consuming an acai supplement daily is one of the best ways to help cover the recommended daily amount of antioxidants in the diet. Acai berries are rich in monounsaturated fat, dietary fibre and phytosterols that support the health of the cardiovascular system. It is also a source of anthocyanins as we have noted above, the same substances that gives red wine its healthy properties. Anthocyanins are natural pigments with a polyphenol structure and a powerful antioxidant effect that ensures better blood circulation and protects our bodies against the accumulation of fat in the arteries (arteriosclerosis). Acai berries have up to 44 mg / 100g of anthocyanins, a higher dose than other foods such as strawberries, plums and red wine. Acai berry is also rich in medium-chain fatty acids, such as oleic acid (omega-9) and linoleic acid (omega-6). These fatty acids help lower LDL cholesterol levels and raise good HDL cholesterol levels. Their high proportion of vitamin C is noteworthy, since being a citric fruit they contain a large amount of this essential micronutrient to strengthen the immune system. Since it has an optimum nutritional profile, taking acai extract can lead to an increase in general levels of strength and energy and can help one to combat fatigue and physical tiredness. 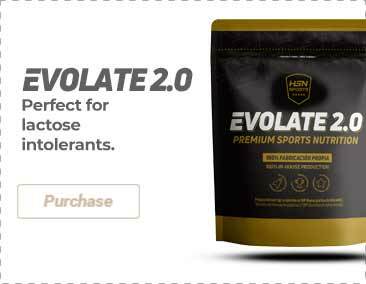 It is a highly recommended product for athletes and other active individuals. Acai berries are rich in dietary fibre. Fibre is essential for increasing intestinal mobility, especially in the colon, helping to prevent and mitigate certain digestive disorders such as constipation for example. It is a source of calcium, helping to maintain and strengthen all the bones in the body and preventing bone fractures and diseases such as osteoporosis. Acai extract can positively affect a weight loss diet in several different ways. On the one hand, acai berries contain high levels of fibre which naturally decreases the appetite. Fibre is beneficial for stabilising blood sugars. Acai berries help to prevent the accumulation of body fat and avoid insulin spikes that can transform excess sugar in the blood into fatty tissue . It is suitable for anyone who is looking to add a food capable of improving their overall health to their diet. It is suitable for anyone seeking an antioxidant booster (athletes, senior citizens, smokers, etc). It is beneficial for those who are dieting or losing weight. People seeking to enhance their cardiovascular health (helps reduce bad cholesterol).